The Bridge House is a beautiful display of architectural craftsmanship. 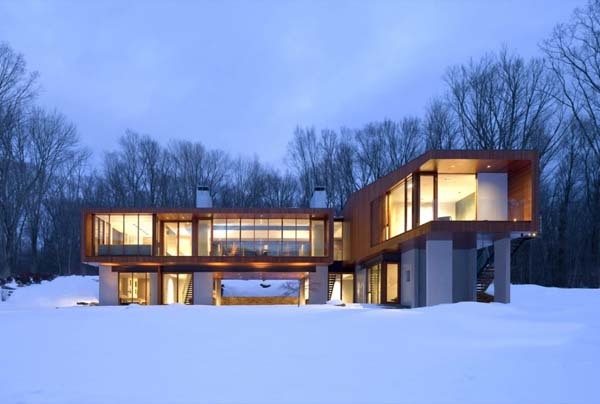 Developed by Joeb Moore + Partners Architects, the home can be found in Kent, Connecticut near the wonderful Kent Falls State Park, on a ridge parallel to the Housatonic River. The nearby cascading falls and historic covered bridge served as inspiration for the architects when putting together the conceptual design for this home. The residence supposedly acts like a connection between the rough terrain and the river's flow, almost like a bridge. The wooden part of the facade rests on concrete structures that keep the dwelling straight while creating a home suspended over a beautiful landscape. Large glazed windows on each side of the building allow in as much natural light as possible.